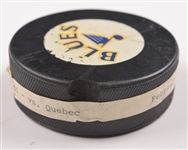 Representing his 4th hat trick while in The Gateway City, we have the puck Brett Hull used to score his third goal of the game, in a 9-2 win at home in 1989-90. Serving as his 5th career hat trick and taking place in a Feb 15th contest against Quebec, Hull would score his 53rd, 54th and 55th goals of the season, with the offered puck number 55. 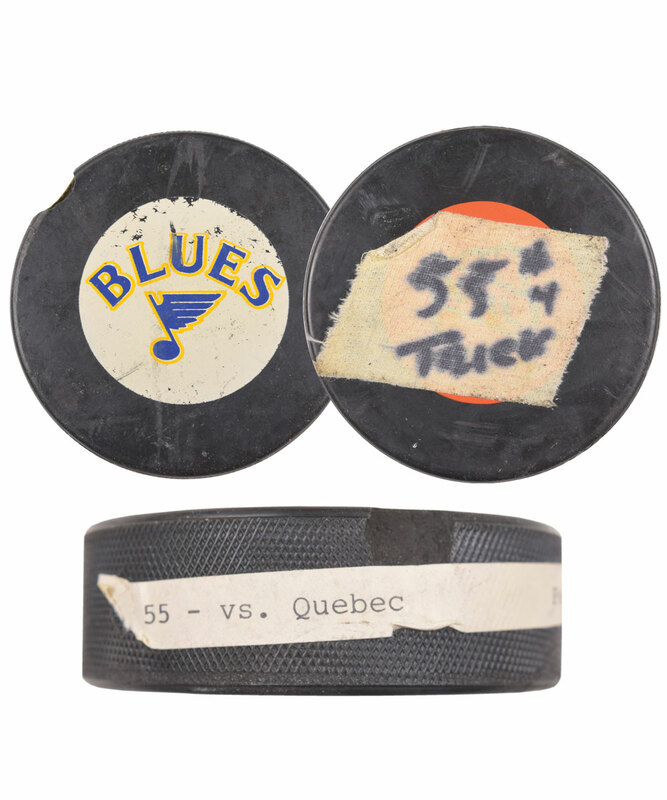 The official InGlasCo Blues puck has a thin label affixed to the side with typed particulars including “55 – vs. Quebec Feb 15, 1990”, with a piece of tape with “55th 4 Trick” handwritten over the InGlasCo logo. A signed LOA from Brett Hull will accompany. The Blues logo shows wear, with the tape added over the InGlasCo logo darkening over time, with the handwritten text bleeding into the material. The typed label along the side also shows some damage, with a large gouge along an edge just above. With 5 seasons of scoring 50 goals or more, Hull would conclude the 1989-90 campaign with 113 regular season points, including 72 goals, with his 55th scored serving as his 129th regular season career goal.